Black Widow Spiders, aka poisonous arachnids, are abundant in the Okanagan Valley. Poised, elegant and fierce; it is the shiny black females with their. 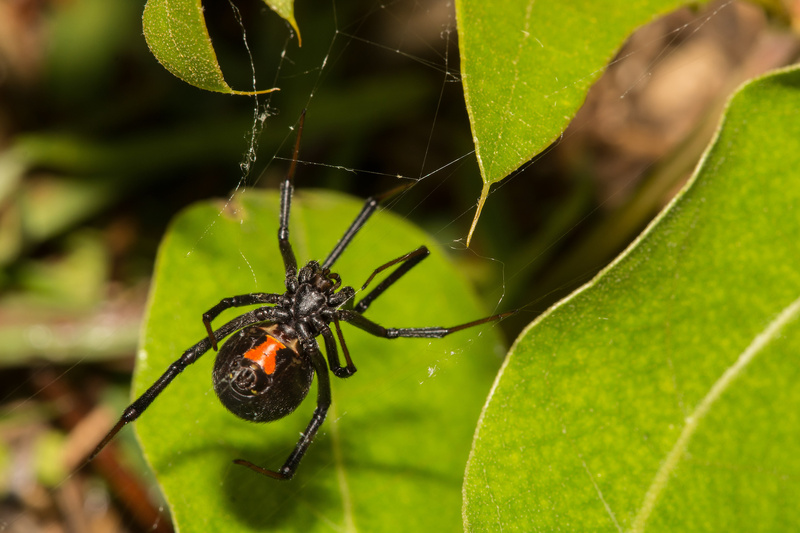 Black Widow Spiders, aka poisonous arachnids, are abundant in the Okanagan Valley. Poised, elegant and fierce; it is the shiny black females with their red/orange hourglass pattern on their abdomen that we need to be aware of. The male species are actually gray or black with small red spots and do not have the same venom issues. Children need to know what these spiders look like and that is vital to call an adult if they see one. Corners, dark places, woodpiles and tangled webs near the ground or amongst the pine needles are common locations for them to nest. Be vigilant near logs, drainpipes and pinecone piles. Kelowna’s BugMaster team can help you efficiently remove these hazards from your residential or commercial space. The Black Widow is the most poisonous spider in North America! She obtains her name from her habit of eating the male after mating. Females can lay up to 200 eggs, which incubate for approximately 20 days. Upon hatching, the baby spiders stay inside their cocoon for up to 30 days before venturing out into the world. Female Black Widows hang upside down in their webs, exposing their famous hourglass markings as they await vibrations indicating prey within their web. Thankfully, the venom is rarely fatal to humans; however, small children and the elderly may be more severely affected. Those who suffer from a bite often experience severe pain and nausea. This is a great YouTube Video to view with your family. Monitor Shoes, Gloves, Outdoor Play Sets, Fire-Pit Areas etc. Do a perimeter check with your family to see if there are any nests to be aware of. Remind your kids that it is important to bang out their outdoor shoes or garden gloves prior to putting them on. Black Widows like dark places and may hide in boots, running shoes or those gloves you keep near the woodpile. If you make it a habit to shake out shoes and gloves or bang them a few times prior to placing hands and feet inside, you may save yourself from a nasty bite. Quite reclusive, these spiders generally bite in defence. Innocently grabbing a toy that has been left outside for a while or chasing a ball to the corner of your fence line can lead to an encounter. Encourage kids to pack away their outdoor toys in a covered container, Rubbermaid or toy bin that you can close for ultimate protection. Keep bedroom floors clean and free from piles of laundry or toys to ensure a safe and secure environment. The Kelowna BugMaster team offers pet and child friendly products to spray along your interior and exterior to help keep these spiders away. Treatment is often repeated to ensure any eggs or young are kept at bay. If your kids are helping with gardening chores, lawn mowing etc. makes sure they know what to look for when they are grabbing items from under your deck or in your shed. The Okanagan is home to a variety of pine and fir trees and copious amount of pinecones and needles. Remove these piles from your property on a regular basis to keep the spiders from taking up residence.